Mirador Rio Hotel, Rio de Janeiro, Brazil details from BrazilBookers.com. 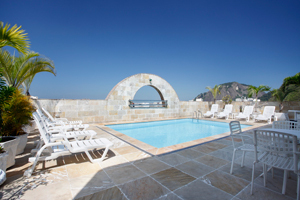 Leisure travelers, honeymooners, holidaymakers as well as business travelers can now prefer to stay in the Mirador Rio when visiting the vibrant city of Rio de Janeiro, Brazil. The hotel is located just three blocks away from the beach. 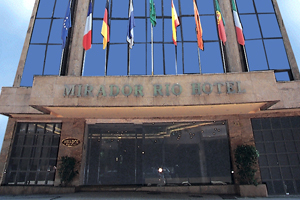 Mirador Rio has got 138 fully air-conditioned rooms, all with cable TV, internet, mini-bars and safety lockers. The hotel has also got a rooftop bar that offers breathtaking views of the Corcovado and the Sugar Loaf Mountain for its guests. Other facilities include fitness center, sauna and swimming pool. Additionally, Mirador Rio offers complete breakfasts and multi-cuisine lunch and dinner to its guests. © Copyright Bookers International, LLC. All Rights Reserved – Information on Mirador Rio Hotel, Rio de Janeiro, Brazil details from BrazilBookers.com.